Any Oakland product can be modified to suit your needs! Need a certain width, height, drawer count, added hidden storage, finish… Any Oakland Waterbed can be built the way you envision it. Feel free to call, stop in or drop us an e-mail and let one of our friendly knowledgeable staff assist you with more information on these unique, customizable products. 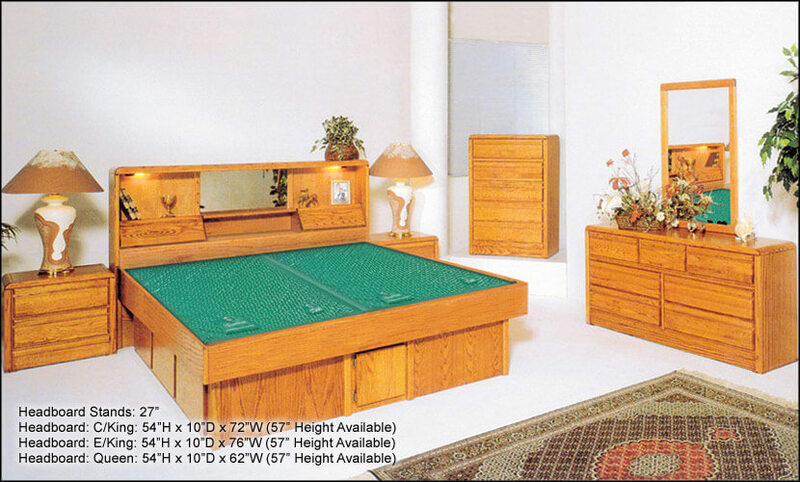 Learn what comes with this bed, measurements, and specifications below. Built from Northern Red Oak: NRO is slow growing which generates solid dense grain which in turn results in a harder wood. We know you will appreciate the beauty of this bed and it will provide you and yours decades of charm and memories for you and yours. 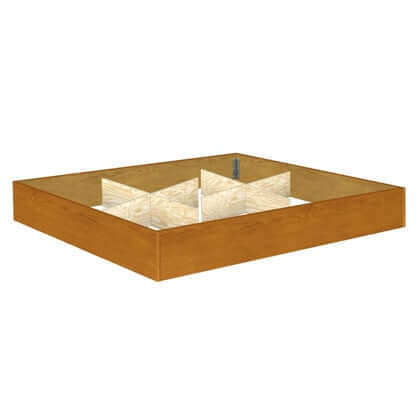 Oak Plywood Veneer: Some of the finest furniture pieces in the world are made from veneers to prevent lifting, swelling, and delaminating associated with cheap poorly made furniture. 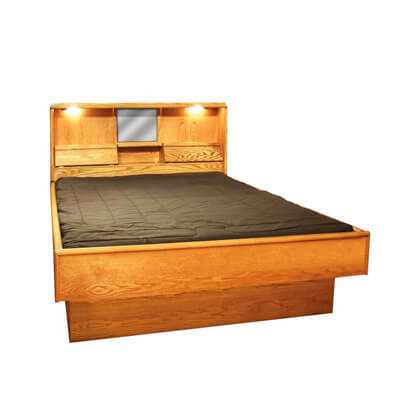 Traditional Free Flow Mattress: This is our traditional wavy gravy old school waterbed feel. Optional baffled mattress available at additional cost. Standup Liner: The final safety net to protect in case of mattress failure and shelter mattress from hardware and waterbed decking. Hand Sanded: with that personal touch you demand by our own wood craftsmen for timeless beauty and stylish lasting design you have always dreamed of. Satin Lacquer Finish: Classic smooth luster with an exceptionally smooth finish that is extremely easy to maintain and will add charm to your bedroom sanctuary, spare bedroom, or child’s room. Premium Grade Mirror:Take notice of our true reflection glass which is free from misrepresentation found so often in “comparable” headboards and projects an for accurate image without distortion. Waterfall Corner Construction: Soft rounded edges and corners offer are eye appealing and unique for up to date sleek styling. Additional Headboard Storage: Offers additional added space and function to your bedroom especially for those who don’t have the luxury of space for additional furniture like nightstands. Lit Headboard Alcoves: Added lighting above each shelf. Perfect as a nightlight or for working/reading while in bed. Cubby Storage: Each side has storage compartments for extra handy storage and privacy.